Donald Porter Andre, 78, a retired Air Force lieutenant colonel who later operated an Arlington antique store, died of cancer February 18, 1998 at the Hospice of Northern Virginia. Colonel Andre served 27 years in the military before retiring in 1966 from an Air Force research and development unit at the Pentagon. Earlier service included duty in Paris as executive officer to the chief of staff of the joint services European Command and operations officer with an advisory group for aeronautic research and development. During World War II, he served in the South Pacific with the 13th Air Force. Later postings included three tours of duty at the Pentagon, including duty in the office of the Joint Chiefs of Staff. He settled in the Washington area in 1951. His military decorations included an Army Commendation Medal and an Air Force Commendation Medal. After retiring from the military, Colonel Andre operated Andre's Antiques in Arlington. He retired from there in the mid-1980s. Colonel Andre, a resident of Arlington, was born in Longmont, Colo. He attended the University of Denver before enlisting in the Army Air Corps at Fort Logan, Colorado. Survivors include his wife of 55 years, Virginia Jones Andre of Arlington; three sons, Donald P. Andre Jr. of Auburn, Calif., and John D. Andre and Curtis Wade Andre, both of Arlington; two sisters; a brother; and a grandson. 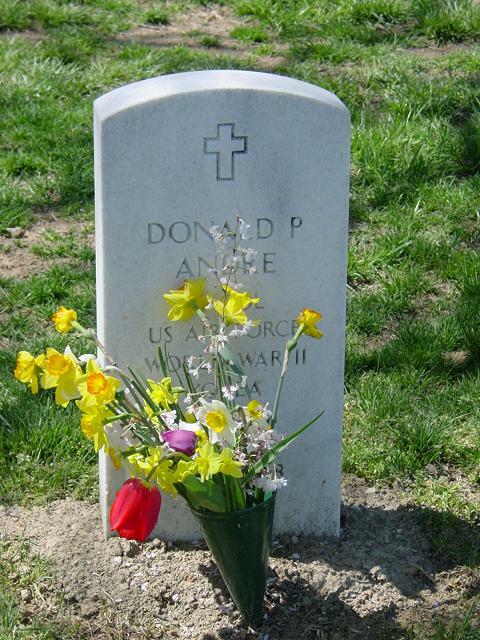 On Wednesday, February 18, 1998, of Arlington, VA. Beloved husband of 55 years to Virginia Jones Andre; loving father of Donald P. Jr., John D. and Curtis W. Andre; grandfather of Jason W. Andre; brother of Vivian Byars, Maxine Perko and Archie Andre. Also survived by his daughter-in-law, Cherie Andre, as well as several nieces and nephews. Mass of Christian Burial will be celebrated at The Fort Myer Old Post Chapel, Monday, March 2, 1998at 12:45 p.m. Interment with full military honors, Arlington National Cemetery. Memorial contributions may be made in his memory to Hospice of Northern Virginia, P.O. Box 922, Falls Church, VA 22040.